It is with great sadness that the family of the late ¬¬¬¬¬¬¬¬¬¬FRANCES M. MITCHELL of Marystown announces her passing at the Health Science Centre in St. John’s on Monday, May 28th, 2018, at the age of 84. Leaving to mourn with fond and loving memories are sons, Charles of Marystown, Victor (Alberta) of Marystown, and Louis Jr. of Marystown; daughters, Mildred Williams of Marystown, Lavina (Peter) Molloy of Marystown, and Linda (Clayton) Gover of Marystown; sons-in-law, Lyola Clowe of Marystown, and William Power of Marystown; brothers, Jerome (Elizabeth) Miller of Marystown, and Dominic (Charlotte) Miller of Marystown; 18 grandchildren; 19 great-grandchildren; plus a large circle of extended family and friends. She was predeceased by her husband, Louis Sr.; daughters, Margaret Clowe, Georgina (Thomas) Kilfoy, and Jacqueline Power; granddaughter, Nadine Williams; parents, Charles & Mildred Hanrahan; sister, Magdalene (William) Coady; and brothers, Charles (Carrie) Hanrahan, and John (Mary) Hanrahan. Mass of Christian Burial took place at Sacred Heart Roman Catholic Church in Marystown on Thursday, May 31, 2018, at 2:00 p.m. Interment followed at Sacred Heart Roman Catholic Cemetery in Marystown. 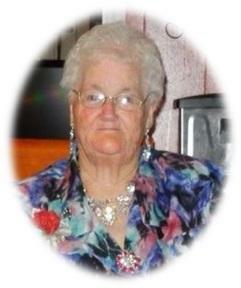 In Frances’ memory, donations may be made to The Mitchell Family or flowers gratefully accepted. Funeral arrangements was entrusted to the care of Wiseman’s Funeral Homes – Marystown.